Decision of Bhasha Andolan to continue the silent Black Flag campaign despite repeated Cabinet decisions read by many as the victory of this unique campaign, seems absolutely correct. Chief Minister of Orissa is shying away from saying why he failed to bring in the promised amendment in Orissa Official Language Act for punishment to whosoever acts against the very purpose of creation of Orissa. On grounds earlier elaborated in these pages, the Representative-in-Chief of this site Subhas Chandra Pattanayak was nominated to the ’Ministerial Committee’ created on working of the Act. He had located two lacunae, which, unless removed, would always render the Act inconsequential. Firstly, there was no provision for punishment against contravention of the Act; and secondly, there was no authority given to the government in the Act to frame Rules to drive the Act ahead, equipped with provision to execute prescribed punishment in case of contravention of the Act. He had submitted a draft for amendment of the Act to authorize the Government to frame the Rules and another draft detailing the Rules and procedure he proposed for punishment to contraveners of the Act. His draft Rules also contained several other sections for complete implementation of the Act. On getting these drafts, the Chief Minister was in fidgets, because of his total inability to work in Oriya. He shrewdly killed the Ministerial Committee. Under the circumstances, Pattanayak notified the people in his social media page as above and prepared for a new type of movement. In order to wake up the people to the severe danger to their language, he, who had, in his book ‘Role of Mass Media in creation of Orissa‘, given the first ever trumpet call in 2009 for reviving the lost linguistic nationalism, planned out how to build up an agitation which the Government cannot legally suppress. 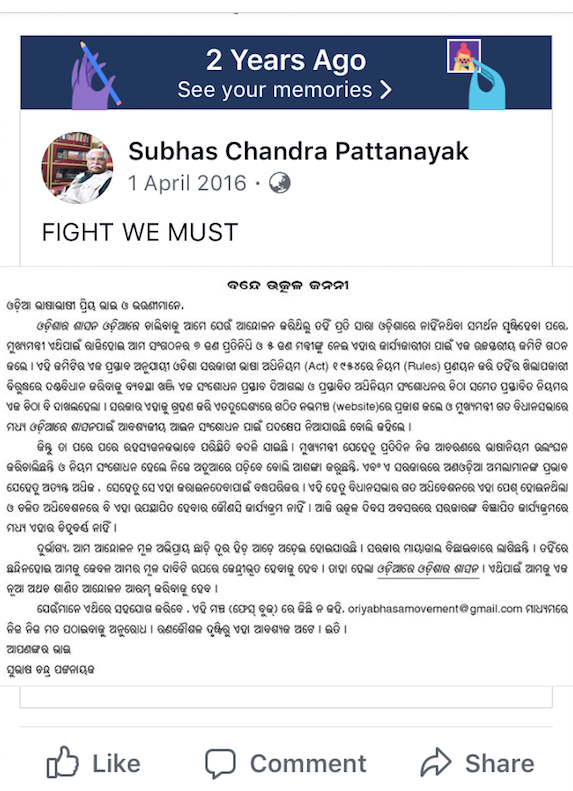 Media consultant Pabitra Mohan Maharatha, his close colleague in Save the Samaja campaign, pledged total support to him and then the duo approached three other media persons, namely Pradyumna Satpathy, Tusarkanta Satpathy and Sagar Satpathy and Bhasha Andolan took birth. After 39 days of this epoch making movement, the Chief Minister announced to accept the first demand. The Act would be amended in the next session of the Assembly, he announce. Bhasha Andolan insisted that if the CM was sincere in his statement, he should bring in the amendment under an Ordinance the same day. This demand was accepted and the Act was amended by an Ordinance on May21, 2016 and assurance was announced to create the Rules, as per the draft mentioned supra. We are putting here a TV Channel discussion to recall the day. Bhasha Andolan had suspended its Black Flag campaign till August 15, 2016 relying upon the CM’s announcement to create the Rules by August 14, 2016. But the government hoodwinked the people by making a harsh of Rules that only appointed a Committee of a group of officers to act as ex-officio members. Bhasha Andolan rejected that farce and revived its Black Flag campaign. Tremendous popular support to this epoch making movement made the Cabinet have a special meeting at Puri where the ruling party was holding its 20th anniversary on 26th December 2017. It unanimously resolved to accept the Bhasha Andolan demand for punishment to contraveners of the Act. But the Bureaucracy infested with anglicized mentality to whom the Chief Minister’s aversion to Oriya language suits most, foiled the collective wisdom of the Cabinet. Attempts were made to persuade the Bhasha Andolan to stop its Black Flag campaign in view of the speaking resolution of the Cabinet. The movement leadership refused to to be hoodwinked in view of its 2016 August experience. The Black Flag campaign shall continue till the legal provision is unambiguously made, it said. Instead of taking to task the mandarins who disobeyed the Cabinet resolution, the Chief Minister continued to foil the very purpose for which Orissa was created. His ministerial colleagues with enough political experience, in a meeting on 14th last month, resolved again to provide for punishment to contraveners of the Act, by amending it in the proximate session of the Assembly. The Cabinet also declared that from Utkal Divas, which is today, Oriya would be inviolably enforced as the language of service to the people.But, the Bill of the proposed amendment is not even drafted till date and yet again the Chief Minister has failed to make his administration obedient to the Cabinet. This scenario juxtaposed with the TV Channel discussion embedded above makes it clear that by refusing to be hoodwinked by the Cabinet decisions the Bhasha Andolan has taken the correct stand. This movement is the last hope for Orissa. “Sampurna Surakya Kabacha” &many more populist schemes they can. Now road repair work,bridge construction will start in full swing to show the people of Odisha that Govt is doing something. But truth is something different. Chattishgarh & Jharkhand are constructing dams & barrages on the upper steam of river Mahanadi and Brahmani without any hurdle. Odisha govt is clueless about stopping the above constructions or not interested to resolve the above issues.They just want to make Mahanadi a political issue.So,in coming years Odisha will face acute water crisis &drought. Due to unnecessary politics,insensitive administration/people,Odisha will face lots of crisis which can be reverted if timely action will be taken. From Kaveri issue,it’s clear that a tribunal cannot resolve the inter state water disputes. to stop further construction over river Mahanadi and Brahmani(writing letters will not resolve these issues). But the state govt has no plan or policy to resolve these disputes,rather they want to exploit Odia people,who are more interested to get exploited. or taken advice of experts from Odisha to resolve the above crisis. issue which is dangerous.Instead of moving for a solution,Odisha govt is creating new crisis and confusion. After getting classical language status in year 2014,still State Govt was not able to open a Odia language University and Central Institute of classical Odia but hype a lot regarding selection of land/area for these institutes. Odia language in judiciary & employment,a goal still to be realized.The basic step of making Odia compulsory from primary to intermediate/graduation(including state board,CBSE,ICSE etc) has not taken up seriously. On the issue of employment generation or job creation Odisha govt is doing absolute nothing. Officially,more then 10 lakhs youths are unemployed in Odisha state,unofficially it may cross 15 lakhs or so. Every year thousands of youths are migrating to other cities like Delhi(NCR),Bangalore,Mumbai,Surat in search of job but in Odisha non-Odias are grabbing our jobs(pvt & govt both) without any hindrance. A genuine demand of increasing the maximum age limit in state govt jobs from 32 years to 42 years has not been met.We can imagine that if migration for job with such a large number will take place,no doubt it will affect the demography,language of a state.The same thing is happening in case of Odisha state. for Odisha state and it may aggravate in future. Therefore,instead of speech/promotion we need concrete action to resolve the issues at the earliest. Wonderful web site. A lot of useful info here. I’m sending it to some pals ans also sharing in delicious.